This book “ Yadi koi pooche” (If Someone Asks) is a translation of the legendary Masaoka Shiki’s Haiku into Hindi done by Angelee Deodhar from a standard English Translation made by the translators of the Shiki-Kinen Museum, Matsuyama. It is a selection of 116 Haiku, out of more than 23600 Haiku written by Shiki. 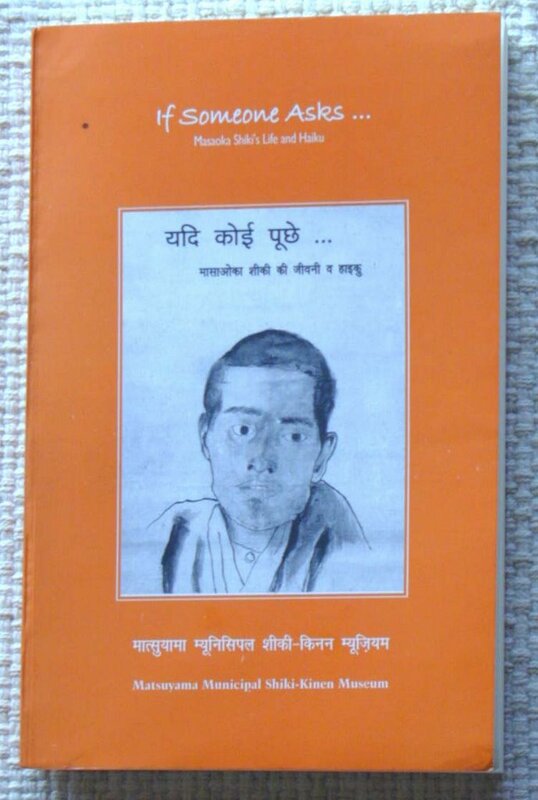 After the Hindi translator’s note and preface, there is a brief biography of Shiki and a fine chronological account of his life followed by notes on Haiku, Translation, and Romanization which are all rendered in English and Hindi translation. Translating these Haiku surely must have been very challenging. She bestows a great honour to the Hindi Language and Hindi readers by rendering this great service to popularize Haiku and Shiki in Hindi. But majority are a challenging task for the translator and Angelee Deodhar has shown her deep sensitivity to the genre of Haiku and its unique expression in Hindi. This is not surprising since Ms. Deodhar is a distinguished Haijin writing in English. We provide below a few samples. The season and the kigo are given for each Haiku and this enhances the reading experience. There are excellent notes by the English translators and these are rendered in Hindi too. Perhaps, Ms. Deodhar could add additional notes about her Hindi translation too which would be useful to potential translators and readers too. Ms. Deodhar has taken considerable care to make this translation as perfect and useful as feasible. Of course, one may sometimes feel an alternative possibility: this is inevitable since translation is a subtle art that can be approached from different perspectives. Altough it is legitimate and appropriate to use English words like ‘nurse’ ‘diary’ ‘violet’ ‘deutizia’ etc. in the Hindi version, in some cases like ‘kingfisher’ and the ‘mount’ in ‘mount Tsukuba’ one may wonder why some Hindi equivalents are not used. These are general observations not to detract us from the general excellence of this meticulous translation. The book closes with a brief suggested reading of English books on haiku, index by season in a bilingual format, a note about the orginal translators from Japanese into English with their names and their original acknowledgments also in English and Hindi. The page design of the book is excellent. My only suggestion is that font sizes could be slightly increased. The few photos of Shiki and paintings by Shiki in the beginning of the book are a rare collection. The book’s cover looks somewhat ordinary and gives it a solemn appearance of a textbook in my opinion. Perhaps, Angelee Deodhar could use one of Shiki’s paintings or even one of her digital Haiga on a Shiki Haiku and design a more exotic cover in a future edition. [ The Shiki self-portrait now on the cover could be pasted inside ] She has many lovely digital Haiga also to her credit we may note in passing. I also humbly suggest that a possible edition with the Japanese originals with Romanizations may be useful to a minor group who have some knowledge of Japanese and who are adept in Hindi. A brief biographical note of the translator will also be appreciated. The Title of the book “If someone asks” [“yadi koi pooche” ] is appropriately taken from Shiki’s Haiku given on the back cover trilingually. Well begun is surely half done. This is a great beginning made by Ms. Angelee Deodhar. We may hope that many more such translations of Haiku and Haiku related materials will appear in Hindi and other languages, Indian and otherwise. A Book Review of a A Hindi Translation of Masaoka Shiki’s – If Someone Asks . . .by Dr. Angelee Deodhar. One morning, I received a mail from Angelee saying that she has sent me her book, a translation of Shiki’s poems into Hindi. I waited and waited for its arrival. I was more than rewarded . . . I read it many times over, both the English and the Hindi versions. 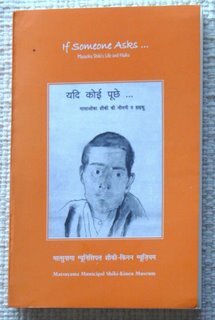 If Someone Asks . . .Masaoka Shiki’s Life and Haiku, originally published by Matsuyama Municipal Shiki-kinen Museum has now been translated into Hindi – India’s national language – by the renowned haiku poet Dr. Angelee Deodhar. Ms. Angelee in her translator’s note says: "Masaoka Shiki, though well known to the western world through numerous excellent translations, is little known in India. The paucity of haiku related material to readers of Hindi made me take up the task of presenting this book. It was an arduous task and some might question this translation. However, since one must start somewhere, I felt it would be worthwhile to introduce in Hindi this selection of Shiki’s work, originally done into English by the sixteen translators of the Shiki-Kinen Museum, Matsuyama. It has taken three years to do this work"
Translation cannot be everyone’s cup of tea. It needs a certain sensitivity, a certain way of seeing things, through the eyes of the poet and the translator, the experience and what is experienced. To be able to stick to the spirit of the original and still get into the skin of the translated language. In other words, not just to translate but to trans-create, which can be done only when the translator internalizes what needs to be translated. The amount of time, effort, inclination, and pure love that this kind of work demands is clear when one comes across a good translated work. Then comes the art of translating haiku, which is so simple that it becomes complicated. All great art is simple. It looks simple. From page one, Ms. Angelee’s translation sticks to the original, a faithfully and honest rendering of the Master. Hindi when spoken as it should be spoken sounds simply beautiful – the language of the great poets like Saint Kabir and Saint Meera is both lyrical and forceful.I’ve put a few of Ms. Angelee’s Hindi translation into Romaji for your reading pleasure; just read aloud and feel the texture of the words – the experience is rewarding! At first glance, I must own I was slightly disappointed with the cover. But after giving a thorough reading and seeing the world through Shiki’s eyes, his self-portrait said so much more and seemed so meaningful. The editing is faultless and all the credit should go to Dr. Angelee. Any translation, if well done, is like the two faces of a coin. Even after it has settled down well in its new language it makes the reader ‘hunger’ for the original. If this happens to the reader after reading this book, it is the most beautiful thing ever to happen! This is a new book of some international importance. It was published last autumn by Matsuyama Municipal Shiki-Kinen Museum in Japan. the book, though of modest size, is a new addition to a corner of the bookshelves of haiku-loving people across the world, especially fans and students of Shiki. It should be characterised as a selection of Shiki’s haiku in Japanese and English and designed to be read primarily by non-Japanese people in English translation. Sixteen volunteers have worked hard to accomplish this worthy translation project. The book is the result (one wants to say a “triumph”) of five years’ efforts, intensive reading of over 20, 000 of Shiki’s haiku (out of 25, 444 haiku which Shiki is estimated by one academic to have written, or 23, 600 according to this book), and endless discussion among the people concerned. In the preface, it is declared that they are not scholars or professional translators. They therefore restricted their selections to those poems which they liked -- real labour of love. Their favourite poems gave them the starting point: about 500 haiku. These were eventually whittled down to the final 116. Only history will judge the quality of the translation but the unassuming, uncluttered and sincere style in plain English without any extra information imposed on the poems has an immediate attraction and seems most appropriate to convey the feelings of Shiki when he wrote the poems in “simple and direct language, avoiding difficult or esoteric expressions” (quoted from the book’s “Shiki’s Life and Times”). It is an interesting and encouraging discovery that the procedure which the translators formulated for themselves to arrive at final versions looks surprisingly similar to that which the World Haiku Club has created for its Masaoka Shiki translation project. In their useful explanation about how they did the translation work, the translators give an account of what they call an “unusual” process: “With each haiku, we started by writing on a board the translation(s) of one or more of the members. The compact book seems to have everything: photographs, a chronology of Shiki’s life, short accounts of haiku, of translation and of romanisation, a short reading list, the index of selected haiku by season and in chronological order in each section. In other words, the book can also be used as a handy introduction to haiku. The brief account of Shiki’s life set against the time he lived in, only two pages long, is one of the best writings of the kind. Academic books on Shiki in English are woefully needed. However, this book will bring Shiki right into the heart of ordinary haiku-lovers and take them directly through the wonderful world of his haiku poems. Of particular use is the way in which each haiku is arranged: first, it is presented in the original Japanese, followed by the English translation and romanised version. Then the season of the haiku is given with the kigo used both in English and Japanese. The age at which Shiki wrote that particular haiku is also given and last but not least some account (including maegaki) is given in many poems to explain the background and circumstances of the haiku in question. Read the full review here at the WHR World Haiku Review.